After a series of false alarms over the past week, on Friday morning Italy's anti-establishment Five Star Movement (M5S) and the far-right Northern League have finally agreed on a policy program, ending a monthslong stalemate. According to Bloomberg, the proposed program, published on Di Maio’s Facebook page, includes a review of EU fiscal rules, the rolling back of pension reforms that raised the retirement age, as well 15-20% tax thresholds for companies and people. According to an estimate by former IMF official Carlo Cottarelli, it may cost as much as 126 billion euros ($148 billion). 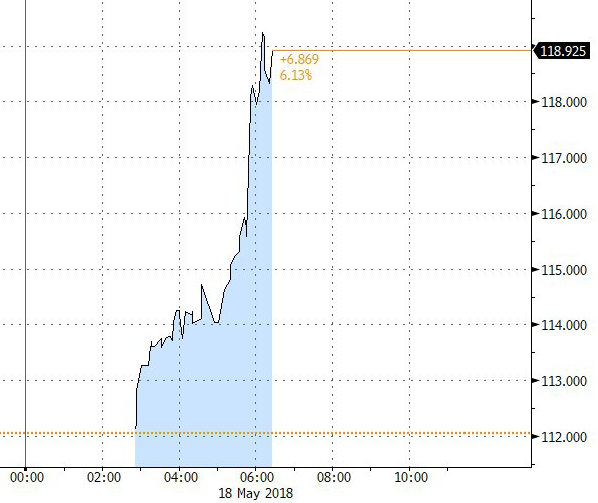 There was some good news: the plan does not mention the dreaded €250BN write-off, and drops the request to exclude QE bonds from Italy's debt/GDP calculations, both seen as euro-positive although the EURUSD promptly sank to session lows after the contract was revealed. The plan also drops reference to euro-exit procedure. An earlier draft of the accord, reviewed by Reuters, had called for the EU to create fiscal headroom for Italy by adjusting the formula used to calculate the nation’s debt burden, which the rules say must be reduced. The “contract” has still to be approved by their memberships, in votes to be concluded by Sunday. "This government contract binds two political forces that are and remain alternative, to respect and achieve what they promised to citizens," Di Maio said, quickly sinking the euro as it headed for what would be its fifth straight weekly fall against the dollar since 2015. Meanwhile, stocks in Milan hit their lowest level in a month as Italian investor fears, inexplicably dormant for months, finally reappeared. 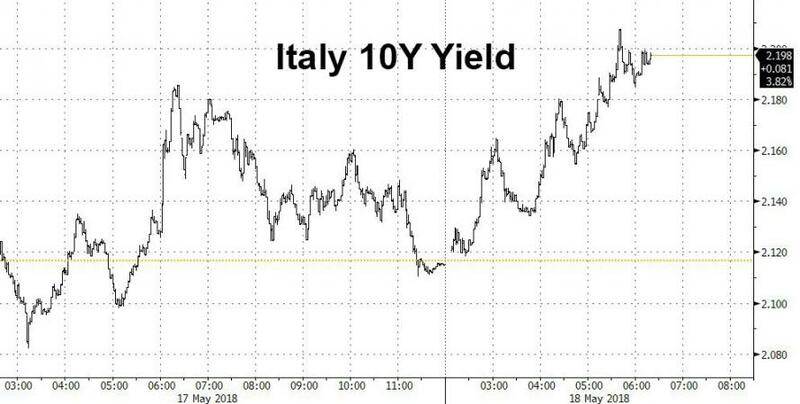 Italian government bonds also retreated on Friday, sending 10-year yields to their highest levels in seven months as investors worried that the new ruling coalition was about to embark on a spending spree. The deal ends a lengthy stalemate that had persisted since Italy's March elections. Recently, the party's were facing the prospect of another vote either over the summer or early next year if they did not agree on a platform. The two parties still need to pick a prime minister.